The battery door latch on the Nikon 990 camera is notorious for breaking. Repair by an authorized Nikon repair shop costs about $100! Now there is a much cheaper option from StonePics. This repair kit is designed for the Nikon 990, but will work with some other cameras designed for four AA-batteries. It includes one large 16 gauge stainless steel hold-down plate and a slotted screw that fits the tripod mounting hole in the bottom of the camera. 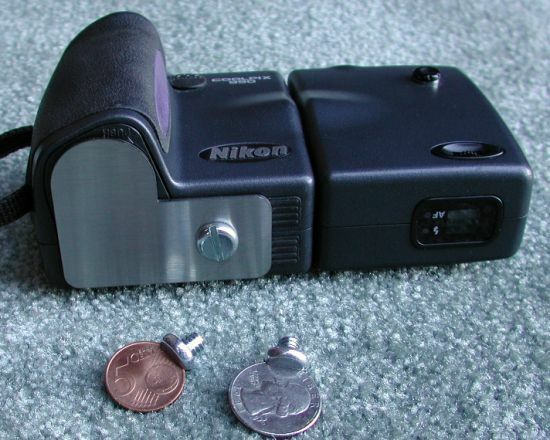 The metal plate holds the Nikon 990 battery door closed when the latch is broken. The screw slot is large enough for turning with a coin. Orders are usually processed as soon as confirmation of payment is received through Pay-Pal. Shipping/handling from Seattle, Washington is free for 1st class mail within the USA or airmail for international orders.